Natural is in our name, and we pride ourselves on carrying nutritious and holistic treats and chews hand-picked for your furry friend. Quality treats add variety to your cat or dog’s diet and promote better overall health. At Family Dog Naturals, we pledge not to sell anything that we wouldn’t feed out own furry family members. Whether you use treats as a training reward or every day snack, they can help strengthen the bond between you and your dog. Stop by today (and bring your companion!) to select something he or she will enjoy. 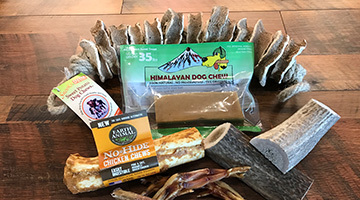 All-natural chews are a safe way to satisfy your dog’s natural urge to chew. Plus, they’re loaded with benefits, like providing entertainment, promoting healthy teeth and gums, and reducing stress. Consult with our team to find a safe, natural choice that will keep your dog chewing happily and ask about our pet health incentives. We are conveniently located off Route 17, only 4.5 miles south of downtown Wilmington in the beautiful Villages In Brunswick Forest, Leland.